Could their be anything CUTER than a dog in a mini tuxedo? We don’t think so! Whether your dog is male or female, there are tons of options to dress them up to be a part of your wedding. Here are a few ideas we adore. Super easy and takes little to no time whatsoever! 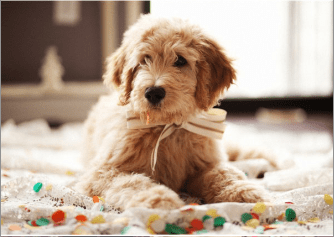 Find a great material, color or design that matches your wedding and tie it to your dog. Make a bow tie, hair bow or even simple collar for your dog to don either at the wedding and/or reception! A simple and creative D.I.Y. 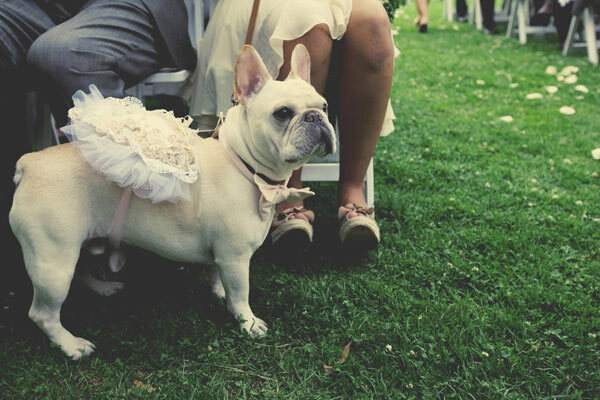 way to dress your dog up for your wedding, without the expensive price tag attached! Pull from your own bouquet or observe some flowers just for your pup to stand out. We absolutely love decorating their collars and leashes. 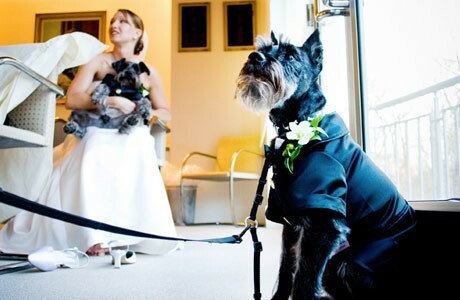 We completely love sweet little dogs in tuxes, veils, anything really! There are tons of online artisans that create cute outfits, designed for your dog in mind. Regardless of size or race there are tons of options when it comes to wedding apparel for your dog. Our favorite? Check them out here! Test It Out: Make sure the attire you choose isn’t too tight or too lose. Don’t Push the Limit: We love our dogs in sweet tulle or flowers, but Daisy may be miserable in it. If your dog feel uncomfortable it will be tricky to have him or her there. Research: When using flowers, make sure to research if the flowers you plan to use could be toxic to your dog.